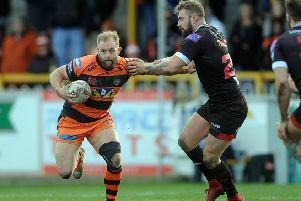 Castleford Tigers’ improved defending at the start of the 2019 Betfred Super League season has pleased head coach Daryl Powell. After beating Hull to back up an opening day success against Catalans Dragons, Powell praised his side’s grit and determination and the improvements they are implementing so far. He said: “We’ve won two tough games now. Hull were really desperate and moved the ball a hell of a lot. “They moved it more than I’ve ever seen them, to be honest and they have some threats on the edge. “Our decision-making was poor at times and that put a little bit of pressure on us. But I thought we showed a lot of character and desperation – some of the try-saving stuff that we pulled off was fantastic. There was a fair bit of spirit. Powell added; “Obviously it’s the start of the season and there’s lots of improvement in us. We did give Hull opportunity to come back into the game with some of our decision making with the ball.